Dr. Stephan Horenstein was born in the USA; Immigrated to Israel in 1980. Horenstein’s works (ensemble, orchestra, soloist, electronics) were performed & recorded worldwide. Many works incorporate Jewish sound sources. Collaborations with Isamu Noguchi, Steve Paxton, Israel Hadany, Rena Schenfeld, Kibbutz Dance Company, Vertigo. Festivals include NY International Festival; Other Worlds (Milan); Media Mix (U. of York); ICMC (Hong Kong; Greece); Israel Festival; Helsinki Festival; Festival D’Automne (Paris), Vision Festival (NY). Recordings: Italy, Austria, US, Israel. Extensive work, Bill Dixon Ensemble (USA, Europe). Education, Trinity College (B.A. ); University of Wisconsin (M.M. composition); PhD, Hebrew University. Taught at Bennington College (1973-‘80). Tel Aviv University, Brandeis University (USA); Residencies: Stanford University; Middlebury College, SUNY, etc. Grants: National Endowment for the Arts, Mandel Foundation, Covenant Foundation, Weizmann Institute of Science. Research: Music and the Perception of Time; Education for Youth at Risk; Music and School Milieu (Israel Ministry of Education and Hebrew University). 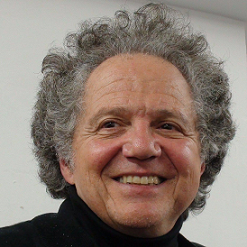 Founder-Director Jerusalem Institute of Contemporary Music (1987-present). Faculty member, Jerusalem Academy of Music and Dance. Winner of the Israel Prime Minister's Prize for Composers (2013).